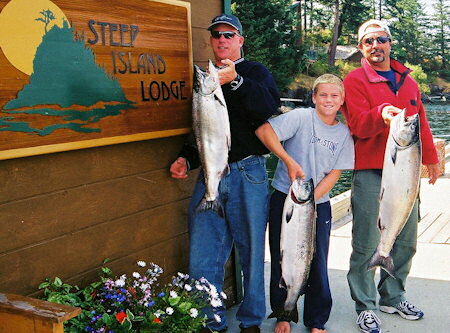 Steep Island Lodge is an all inclusive private island where our guests experience all the natural beauty, fabulous fishing and all the wild life and scenery the west coast of British Columbia has to offer. or diving. And with Steep Island Lodge you receive their friendly personable and attentive service along with luxurious accommodations. Steep Island Lodge can accommodate groups of up to 22 guests, and it is the perfect setting for a family or Corporate Group get-together. 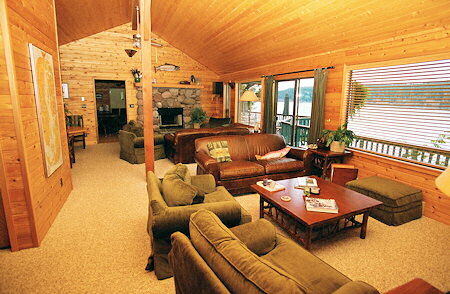 Groups of 12 and more can also have the island, and Steep Island Lodge, reserved exclusively for their group. Guests of Steep Island Lodge will enjoy their own private cedar cabins over looking Discovery Passage providing you with fantastic ocean views, the passing cruise ships, the mountains of Vancouver Island and breathtaking sunsets. 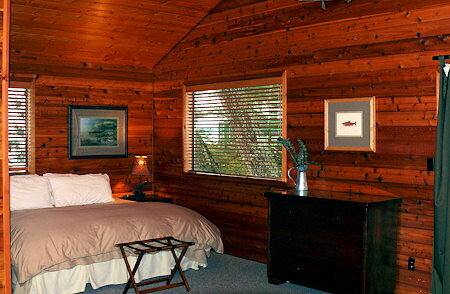 Our cabins are uniquely decorated with attention given to your comfort and pleasure. Wood stoves and duvet comforters add to the cozy and relaxing atmosphere. Now to Fishing!!! Discovery Passage is a southern migration route for all 5 species of Pacific Salmon. Steep Island's location in the Passage makes an ideal take off point to get you to the areas where the fish are moving through. Our guides are all professional local owner / operators who offer you the best fishing opportunities. All boats are 21 to 25 ' cruiser style covered boats, equipped with all the amenities. They are all meticulously maintained, professionally equipped and Transport Canada approved. Our guides at Steep Island Lodge take pride in their boats and their fishing expertise, and enjoy sharing their experience and knowledge with you. The exquisite natural settings of lakes, rivers and streams on Vancouver Island also attract anglers from around the world. Steelhead are present almost year round with both summer runs and winter runs moving through the local rivers. Trout are also present in the local rivers year round, as well as seasonal runs of salmon. 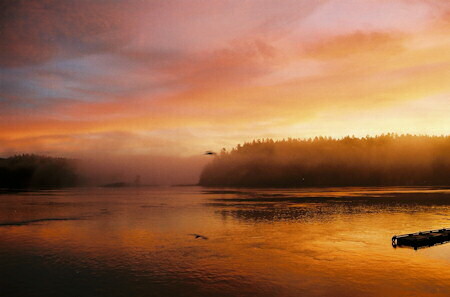 Other species such as pinks, Chinook, Coho and Chum fill the rivers in the fall. The fishing action can be non stop. We also offer spring and fall Freshwater Heli-Fishing packages that include accommodation, meals, helicopter & guide with access to remote wilderness rivers. 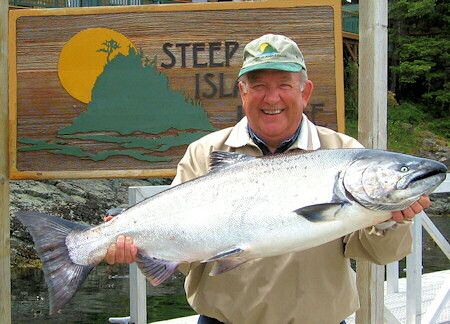 The list of "things to see and do " during your vacation to Steep Island Lodge can go on and on --- from aerial tours by helicopter or plane, to visiting salmon enhancement sites, Native Museums, and other local places of interest. In the fall a popular event is to snorkel down the Campbell River, as the Salmon are heading up river. It is an amazing ride! Don't forget your cameras, Discovery Passage and surrounding areas are truly a photographers dream. Other vacation ideas include hiking, diving, and golfing just to name a few. 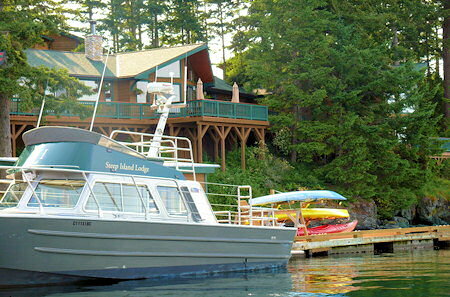 Relax on an eco-tour with Steep Island Lodge in the comfort aboard our safe, fast Transport Canada approved 32 foot Daigle tour boat. Imagine the magic of Desolation Sound, Discovery Islands and Johnstone Strait as you catch the spirit of the whale (orcas, minkes and grays), listen to the sea lions, frolic with the Pacific white-sided dolphins or see bears on the shore lines. Eagles and other water fowl are plentiful along these coast lines. You may also have the opportunity to see pictographs or Petroglyphs, rock paintings and carvings, left by the aboriginal peoples of the west coast. Choose a special family holiday and spend it here where you will have privacy and tranquility for an intimate get together on your own island. 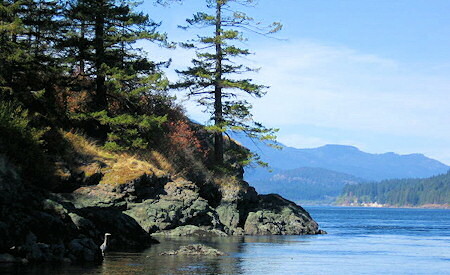 Steep Island is located in the famous Discovery Passage approximately half way up the east coast of Vancouver Island. 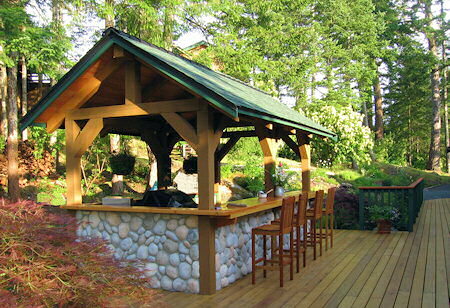 We are situated between the City of Campbell River and Quadra Island.